Why you need a rooftop carrier protective mat? 1. If you load the cargo carrier box/bag, bike, luggage carrier directly on your car roof, there is a big risk that the car roof will be scratched and the cargo will slip and drop. 2. A rooftop mat can be a good protective layer and skid resistant course between rooftop and cargo carriers. Protect the roof from scratch and damage, keep the cargo carrier from slip. Secure both your car and cargo carrier. 1. Our roof rack pad 400g foamed PVC, with very good heat resistance feature, neatly. Premium grip capacity make the roof rack pad more fitted to the roof and enhance skid resistance. 1. You can put the flat side against the car roof. 2. Just use spray-head to clean it, very easy. 3. Multipurpose, if the size is a little large for your car, you can cut the spare part to be used as table foot pad, flower pot mat, drawer liner, shelf liner, carpet stay pad, area rug, kitchen cabinets and so on. PROTECT CAR ROOF AND CARGO: Perfect protective layer and skid resistant layer between rooftop and cargo carriers. Protect the roof from scratch and damage, keep the cargo carrier from slip. Secure both your car and cargo carrier. PREMIUM MATERIAL AND GRIP: Made of 400g foamed PVC, with very good heat resistance feature, neatly. Premium grip capacity make the roof rack pad more fitted to the roof and enhance skid resistance. MULTI-PURPOSE: This non-slip roof mat can be used on car roof, in a truck bed or even as non-slip floor mat. Great to work with roof rack crossbar, roof basket on truck SUV car van and so on to hold the roof carrier box, bag, bike, kayak, etc. 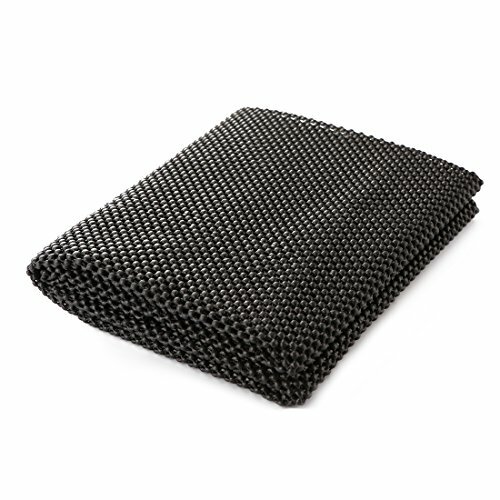 UNIVERSAL FIT: With size 39"x36", this rooftop mat is large enough for most vehicles. Flexible and easy to be cut or folded when it is too big. The leftover part can be used in your tool box or under flowerpot, anywhere you want.